Requires .NET 3.5 or higher (your PC probably already has it). Bonus Chum is a Windows application dedicated to help advantage players verify whether an online casino bonus is worth doing or not. Using the powerful but simple interface, you can tweak options such as the bet size, deposit, wagering, bonus percentage, and whether the bonus is a sticky, cashable, cashback or postwager. From this point, BonusChum will speedily calculate the bust rate, EV (estimated value), and unique to this kind of software, the cash per hour and bankruptcy rate. Those final two stats are often overlooked, but are very important because your time is important, and so is the risk of bankruptcy. The cash/hour rate can show you the value of doing slots over more traditional grinding games such as Blackjack or Video Poker. And the bankruptcy rate can persuade you that the initially tempting 25% bonus is actually just outside the risk you're willing to take. Whether you're starting off with a mere 1k bankroll, or whether you're a millionaire, Bonus Chum will give you the necessary tools to grow your bankroll, safely, quickly, and timely. I originally created this program for myself when I found the two-tier simulator at BeatingBonuses.com lacked some features I needed, but I quickly realized it was a great tool that could benefit many, so I spent time to forge it into a fully-featured application. In addition to calculating cash/hour and risk to bank roll, BonusChum allows you to save your own custom paytables. It is also relatively easy to insert figures into the calculator. For example, the bonus percentage and wagering multiplier (e.g: 40x) figures are entered directly - there is no need to do the math and work out the wagering as this is all done for you. It is also possible to change the house edge for any game. This is useful for say a slot where you know the house edge and approximate variance but don't have the exact paytable to hand. BonusChum has a generic 'Slot' game paytable which you can tailor to suit your needs to cover the thousands of slots that exist. Choose between various games including Video Poker, slots, Blackjack and Roulette. Create your own custom paytables for new games. Choose between Cashable, Sticky, Postwager, or Cashback bonuses. Enter all figures into the simulator directly as the casino gives them. Adjust the house edge of any game to suit your requirements. Generic slot game where you can choose the house edge and variance (volatility). 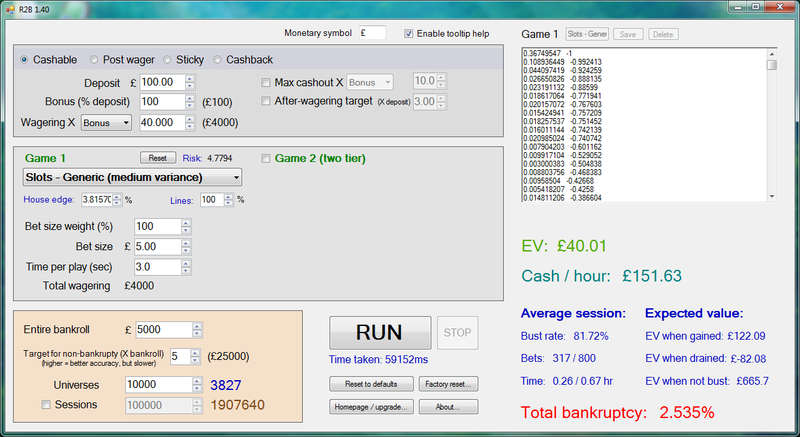 Enter your Bankroll and run the sim to see how risky a bonus is. Enter the time taken per spin, hand, stake, wager, bet, round or deal and Bonus Chum will work out your cash per hour. Easy to use program will full documentation to explain every feature. Load/save projects for later use, and add your own notes. Stealth mode to make BonusChum look like Notepad. License includes bug fixes and various future free upgrades. Once paid, the license lasts forever, including various updates and bug fixes. There is also a 60 day (no quibble) money back guarantee. Each license is valid for a single user. If other people will be using it, please purchase additional copies. Premium and efficient support comes as standard with each order. the difference and notifying me during registration. I can be emailed here. Here is the PAD file. For slots, you can now enter the number of lines. The risk level also now allows fine adjustment (not just 'low', 'medium', 'high', and 'very high'). Settings can now be loaded and saved as projects via dedicated buttons. This allows you to save a offers which you may repeatedly use in the future. Added "Notes" section where you can write whatever you want. Added "Early withdraw" for bonuses that allow you to withdraw even if you haven't completed wagering as long as you never went into bonus money. Loading the program, and spawning a new window is now faster and more stable, not hiding away sometimes. Stop button is more responsive too. Bet sizes can now optionally be a proportion of your balance rather than a fixed amount. This is useful for reaching targets more efficiently. Added "Don't overshoot target/s" mode. This is used to reduce bet sizes when you'd otherwise exceed the target. EV / bankruptcy is now corrected for cashbacks when wagering large proportions of the balance with 'mid-stake-bet-raise' games (e.g: Blackjack). Plenty of other minor tweaks and features. 2016-02-18: v1.86 - Fixed bug if cashback deposit was to zero, and the Cashback type was in Fixed mode. 2016-01-26: v1.81 - Bug fix - the max "Time (hr:m)" value was displayed incorrectly in v1.80. This is now fixed. 2016-01-18: v1.80 - Countries which use the comma as a decimal point are now supported (fixes startup crash). Also, time output now uses hours+mins. 2015-12-29: v1.68 - Fixed subtle bug affecting simulation output which only affected the demo versions. House edge is now saved and restored upon reloading BonusChum. 2015-12-23: v1.67 - Added 'Risk plan' feature and fix to demo version to prevent crash. 2015-12-19: v1.66 - First release!